Each season, since the early 1940's, thousands of youth from the greater Kalamazoo area have been entertained and educated through attendance of or participation in our Civic Youth Theatre program. For many of our young patrons, a Youth Theatre production serves as an introduction to theatre as an art form. Youth involved in a production learn very quickly that it takes a lot of hard work to put on a show. As they memorize lines, paint scenery and collect props, they are also building friendships and develop self-confidence that will last them a lifetime. - have spent their whole lives in blissful captivity before an admiring public and with regular meals provided for them. Not content to leave well enough alone, Marty lets his curiosity get the better of him and makes his escape - with the help of some exceptional penguins - to explore the world. Join Alex, Marty, Melman, Gloria and of course, those hilarious, plotting penguins, as they bound onto the stage in the musical adventure of a lifetime. 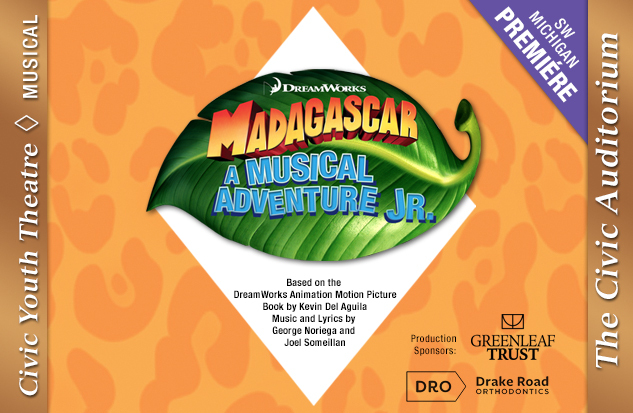 Based on the smash DreamWorks animated motion picture, Madagascar - A Musical Adventure JR. follows all of your favorite crack-a-lackin' friends as they find themselves on an unexpected journey to the madcap world of King Julien's Madagascar. Filled with outlandish characters, adventure galore and an upbeat score, Madagascar JR. will leave audiences with no choice but to "Move It, Move It!" "...a high energy joy ride for kids"
Live flame may be used in this production. Madagascar JR runs approximately one hour without an intermission.